A very fine line separates players laboring in the two Triple-A leagues and those shining in the Majors. 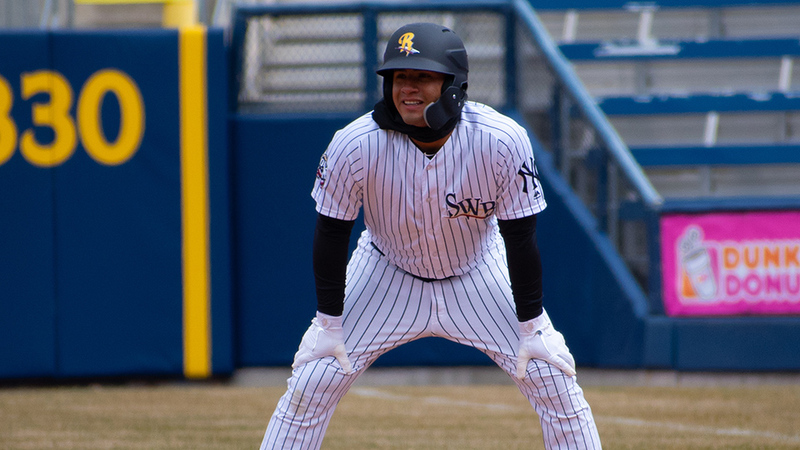 Consistency is a key, something top Yankees prospect Gleyber Torres has found in the first nine games of his season with Scranton/Wilkes-Barre. Arguably his best example of the young year came Saturday. After scuffling for six innings against No. 2 White Sox prospect Michael Kopech, the RailRiders rallied, with Torres doubling twice and driving in three runs in a 10-5 victory over Charlotte at BB&T Ballpark. "With all our guys, consistency is important. Every day in their development, it's the separator at the big league level," RailRiders hitting coach Phil Plantier said. "You have to show up every day, regardless of previous at-bats. You have to show resilience when things don't go your way. "Every day, we want them to try to put together the type of work of someone who deserves to be in the big leagues and carry it over into games and execute at the plate with a level of consistency that can be trusted." Before extending his multi-hit streak to three games, Torres grounded out three times in as many trips to the plate against Kopech. MLB.com's No. 10 overall prospect, who has a 0.90 ERA in two starts, gave up five hits and two walks but just a single run while striking out three. The Knights jumped on the board in the first as Daniel Palka homered for the third straight game, then added three in the fourth as Ryan Cordell delivered a two-run double. After Kopech exited, Scranton/Wilkes-Barre's L.J. Mazzilli followed two walks and two singles with a three-run double to spark a rally in the seventh. With the score tied, 5-5, Torres delivered a go-ahead double. The ability to put his first three at-bats behind him and play situational baseball in a big moment was a sign of things to come, Plantier said. "It was close at that point. A runner on second with no one out and two strikes, it's his job to move the runner and he was rewarded with a double to right," Plantier said. "It's good to see a kid compete against velocity, even if he doesn't get rewarded. But you want to see a young player locked in for nine innings, no matter the early innings." The following frame, Erik Kratz slugged a solo homer before Torres plated Mazzilli and Abiatal Avelino with a two-out double to cap the scoring. After going 1-for-9 to start the season, Torres has been on a tear as of late with five multi-hit efforts in his last seven games and a .389 batting average. That, combined with growing whispers of the Yankees needing an infield spark at the big league level, could balloon some players' egos or kill their concentration. For Plantier, what will eventually earn Torres a promotion is his ability to stay planted and present, both mentally and physically, in the International League. Nights like Saturday have to become the norm, not the exception. "He has a great aptitude and today was a great day for a lot of reasons," Plantier said. "You're learning how to put in quality work every day, put in the proper at-bats according to the situation. The consistency expectations in the Majors is high, and we try to create those expectations here as well so he has something to work on." Mazzilli also finished with three RBIs, while Avelino reached base three times and scored twice.